The Science (and common sense) behind Healthy Service. Every industry has their issues. The Restaurant Industry is one of the most ethical and responsible out there, and certainly one of the largest serving the public. The sanitary issues Healthy Service addresses are ones that have snuck in and embedded themselves. Unfortunately they are nearly impossible to solve by management alone. These bad sanitary habits are engrained in the minds of all service staff and managers and we believe it requires a dedicated effort to help institute the changes necessary. We all know the problems, but there wasn’t much we could do about it, until now. Customers are coming into a restaurant sick. More than half (60%) of the workers could remember a time that they worked when sick. Some of these workers took steps to keep others from getting sick. One in five did not handle food. About one in three washed their hands more often. Almost all (89%) said it was their decision (not the manager’s) to work when sick. Four in ten said their manager did not know what their symptoms were. Just 5% of people wash their hands long enough to destroy infectious germs after using the bathroom, researchers from Michigan State University reported in the Journal of Environmental Health. 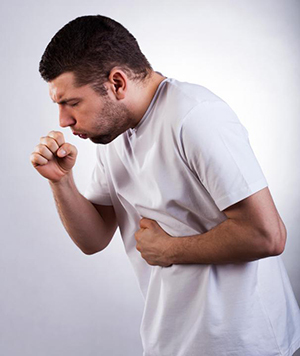 Most do not wash their hands after sneezing, coughing or touching their mouth or face. Most servers and bussers do not wash their hands between bussing and serving. Condiments and menus are not cleaned properly, if at all. Table and dining surfaces are not sanitized properly. Worst of all, most people today do not have proper health knowledge. Many do not know when they are contagious or how to not spread germs and illness to those around them, or to keep themselves healthy. Restaurants are busy places with people requesting the staffs attention from all angles. Customers need to talk to servers, the kitchen needs food run, the tables need to be bussed, the bar needs drinks delivered, servers need to check on their customers again, greet the new table, wash and repeat! How often SHOULD a server wash their hands on a busy night? 244 necessary hand washes x 30 seconds each = 7320 seconds or 122 minutes or 2.03 hours. Obviously this is impossible to tackle without virtually doubling the staff. Many will find these numbers ridiculous, not because hand washing is not necessary, but because it is just not possible. It would never be possible to convince customers or staff to wash their hands every time they needed to. But there is a way to be completely sanitary, and have it be easy enough that people will actually participate. Healthy Service provides the policies, education and tools to make this a reality without huge costs or drastic changes in daily procedures. The advent, and social acceptance, of hand sanitizer is one of many keys to tackling this sanitary issue. It can be used on the fly - as is - where is. One example of its effectiveness is that while you will never convince every customer coming into your restaurant to get up, go to the bathroom and wash their hands for 20 seconds, our research has shown they will readily use hand sanitizer if presented table side. 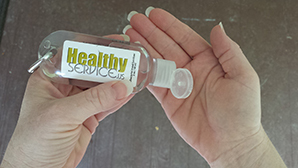 By placing hand sanitizer at tables we are reducing the overall population or germs entering a restaurant. By having service staff carry the clip on hand sanitizer, they can sanitize while walking, every time they need to, without the loss of time. By educating the staff with our online course, they will know how to conduct themselves throughout their days, when they need to take extra care and how not to spread, or catch germs. By not allowing sick employees to work, we reduce mini outbreaks among the staff and the spread of illness to our customers. By becoming Healthy Service Certified you receive the tools to implement the changes and to let your customers know about your commitment to their health. This new standard has significant benefits, not only to the restaurant, and the personal lives of restaurant employees, but to the entire community as well. By becoming Healthy Service Certified, and being a leader in your community, you not only show you care about the standards and success of your restaurant, but that you care about your community as well. ** Just 5% of people wash their hands long enough to destroy infectious germs after using the bathroom, researchers from Michigan State University reported in the Journal of Environmental Health.